The custom cab coolers are patterend to fit your SUV or pickup truck. Cab Coolers protect the cockpit area from UV rays and help reduce heat build-up inside the vehicle. Easy to install, Cab Coolers use hook and loop fasteners under the mirrors and door handles (varies by model). Some patterns include adjustable webbing straps to wheel wells to securely hold the cover in place. 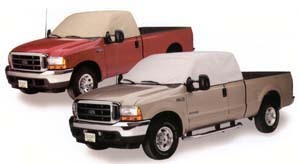 We also carry a cover to cover the entire cab forward to the bumper of the truck.